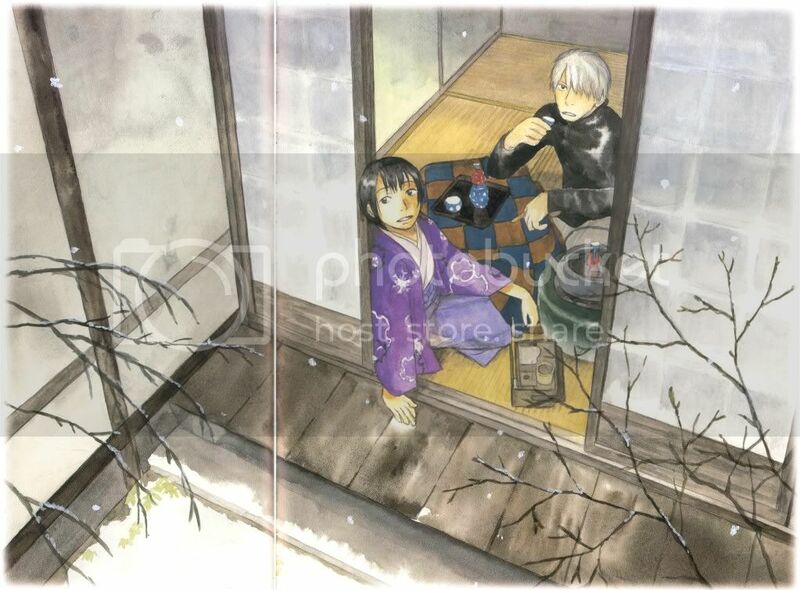 At first, one might think of Ginko as one- dimensional, since he’s pretty stoic and is seen as a wise solitary figure throughout the series, helping people solve their problems. That’s not the case though. Especially, if you have read the manga, you get a glimpse of a younger Ginko making a grave mistake in The Bed of Grass. His mistakes and failures as well as his lack of memory from his younger years, after crossing paths with some mysterious mushi, makes him what he is now. From an orphan without a past, a lost and desperate child, he grew into someone who doesn’t just live. Ginko has come in terms with the fleeting nature of life and his own nature that forces him to never stop being on the move. This man with studiousness and curiosity to unravel nature’s unseen mysteries is a master of his art, a mushi-shi who loves his job. A man with kindness and understanding who doesn’t talk much, yet very serious and straightforward when the situation calls for it. His facial expressions are almost indiscernible, but this doesn’t mean he has none. You just have to be very vigilant to notice the slight upwards curve on his mouth or his mouth opening in weird shapes; the upper eyelid straightening and curving, his thin eyebrow plunging down or raising. Heck, he also gets some chibi form in the last episodes. We’ve seen him smiling to Mio and her daughter in The Offshore Shrine and being very strict with another mushi-shi in The Journey to the Field of Fire. 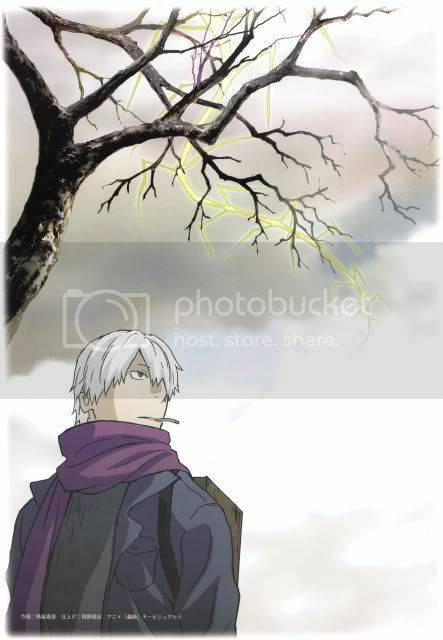 He’s shown yearning for a permanent home only to have him witness another mushishi who tied himself to a place as the master of the mountain having a sad end. He’s shown bargaining and playfully chatting with Adashino as well as scolding him and patting his shoulder to show support. Ginko is humane in every aspect. 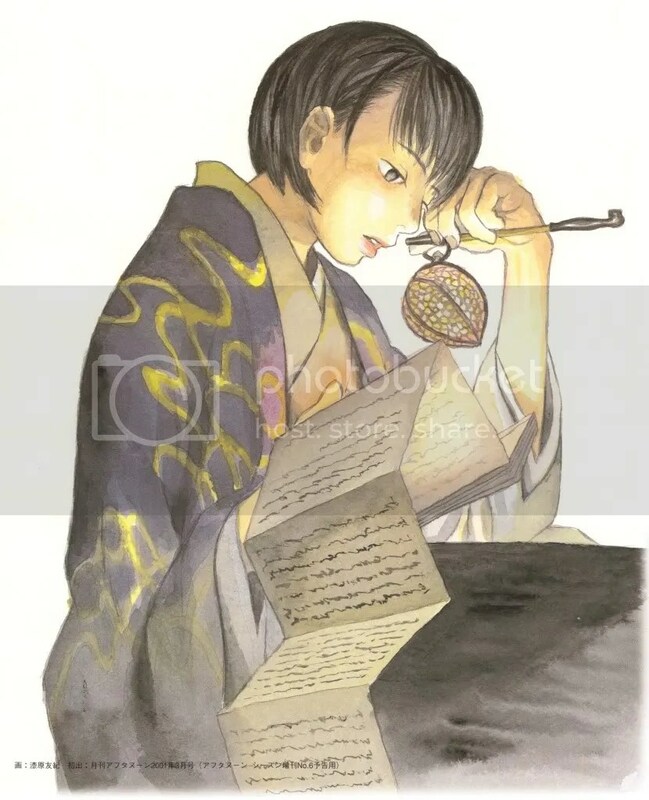 “A girl who is drowning in a sea of words”- that’s how Ginko described Tanyu, the fourth scribe of the Karibusa family that bears the weight of sealing the forbidden mushi in their bodies. The young lady is handicapped from the moment she was born – she can’t walk due to the mushi residing in her right leg. She’s the definition of loneliness, perhaps even more than Ginko: not being able to catch up with other children playing, thus not making friends; living only with Tama in a house that appears to stand in the middle of nowhere; writing down the stories of the mushishi who kill mushi in order to fight her curse, but in the process hurting her soul with the abundance of death that surrounds her, especially in that poorly-litten underground library; her only friends being the bookworm mushi that destroy the paper and she has to copy the scrolls again using her very strong memory; bearing the weight of people living for her and being pressed into following a path, like Tama, the old mushishi, and Kumado, the young man who is practically an empty cocoon, living only because of a man-made mushi … That scene in The Sea of Ink where the text from the scrolls has gone wild and she stands in the middle of the room really captures the essence of her life. Yet, she still tries to hang in there and manages to smile wholeheartedly when Shimi work up their little tricks- they are like her favorite pet (!) We see what a tender and caring soul she has, when she worries about Tama and Kumado, and with what strength has she come to accept her situation and fight, even though the curse might not die with her, much more before her. In The Ragged Road (manga story) where we meet Kumado, we get a taste of how insistent and quite assertive she is in her efforts to elicit and then ‘teach’ feelings to Kumado or even ‘care’ for him (she sent Ginko to ‘supervise’ his actions in one case). Tanyu is an optimist who loves life and its variety, and wishes of a future she gets free from the pain in her leg. This illustration makes me melancholic and fills me with warmth at the same time. A cool guy and an elegant young lady, both witty, both seeking human warmth… what else is there to make them the perfect couple? They care for each other, find comfort in each other, laugh and share sadness together. Their relationship is really beautiful in its tragicness, since both are forced to have a symbiotic nature with the mushi in their bodies; Tanyu is bound to a certain place and Ginko can’t settle down. Meaning that they can’t live together. Their first encounter and last scene of The Sea of Ink are very revealing about the feelings in their hearts. Tanyu who’s fed up with killing stories dismisses a smiling Ginko at the beginning, thinking he’d tell the same kind of stories. But when he starts narrating, she gets enchanted. Isn’t the atmosphere one of love at first sight? Tanyu gets Ginko in the library ‘for him only’ without Tama’s permission and minutes later she says she’ll persuade her. Tanyu asks of Ginko to come again and he accepts “gladly”. Sure she found a source of relief and he a “treasure chest of a mushishi”, yet I can’t get out of my mind their smiles and Tanyu’s boldness. In the last scene of the episode Tanyu’s wish to travel with Ginko is in reality a confession, isn’t it? The fact she hurries to say she’s just kidding not to become a burden, confirms it. She tags at her robe with a caressing motion, like to brace herself for his answer. They would sit close together in the darkness long after he stopped speaking, the silence between them full of all the things they could never say aloud. The line of warmth where their knees almost touched, an unconscious movement that stopped a breath away from being a caress; something delicate that they could never acknowledge. […]’forever’ might have been a word that he used; now it seems naive, if not deceitful. Yet Tanyuu still speaks of the future, her optimism warm as the sun-touched fields they rest in – and even if autumn is already in the air, the moment feels almost like a promise. “It’s a scroll to look at, not write about. Open it, open it.” Here, impatient flicking of his cigarette. […] “That doctor owed me a favor again. He has the original, of course, but I got him to track down its cousin.” “Thank you, really this time. And thank your friend. It’s beautiful.” “True, that. One of a kind.” But he’s watching her face. “Have you been keeping busy?” Tanyuu asked. “Eh, more or less. Mushi are very good at making trouble.” Tanyuu smiled impishly. “But they still don’t cause as much trouble as people, right?” Ginko laughed at that and shook his head no. Tanyuu laughed too, with such cheeriness that Ginko couldn’t help but return her smile. 2. They make smoking very appealing (though they don’t do it because they like it). I really like Tanyu’s pipe. I’d like to have one someday. 3. I get the hots when I hear them speak… such warm and serene voices. 4. Ginko’s real name was Yoki. 5. Tanyu wears a lot of purple clothes. Purple is a color denoting royalty, since the purple dye was expensive. She sure comes from a respected and wealthy family. 6. Ginko’s western clothes are the ‘leftovers’ from a first draft of the story which was meant to be set in modern day. I think it also really stresses his character (practical) and his wandering life. 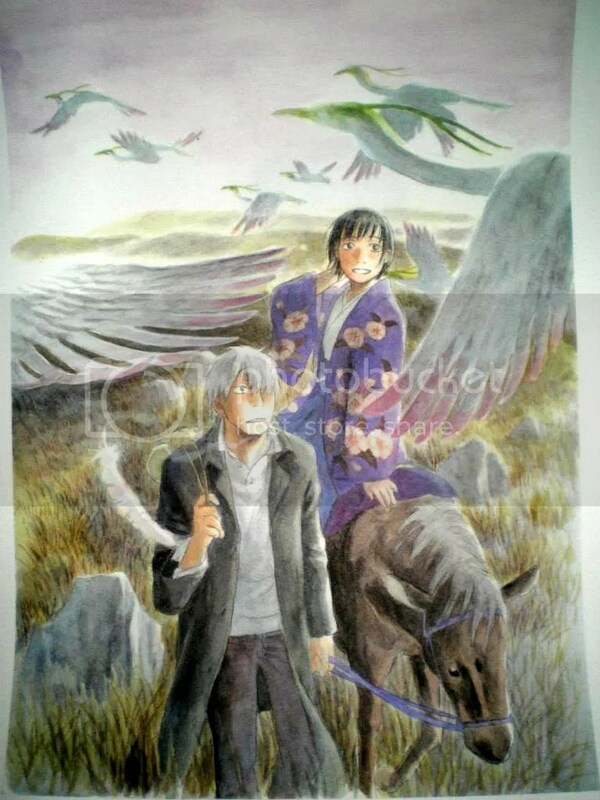 This entry was posted in Commentaries, The Red String and tagged Ginko, Mushishi, Tanyuu by Foxy Lady Ayame. Bookmark the permalink. Ginko can't stay with Tanyu exactly because he attracts mushi. If he stays in one place the balance of the system will fall out and more problems will arise for the people who lives with. Remember, mushi aren't always benevolent, and the reason he smokes is because otherwise mushi swarm around him, not just like to 'hang around him'. If you watch more episodes, you'll see Ginko denying staying in a place for too long for this exact reason many times. This is a very thorough review, what else can I add. Just like you, this is also one of my favourite episodes. I truly love the subtle hints between Ginko and Tanyu and also wish we get to see them together. I don't see any reason why not, since Ginko attracts mushi and Tanyu needs to write mushi stories, so definitely Ginko can stay with her. I have yet to finish the anime so I'm unfamiliar with Tanyu, but I think the tragic beauty persists throughout the story. The episode of “Those Who Inhale the Dew” stays with me in the sense of subtle and beautiful sedation to [cold] melancholy. If anything, the tone at the end of the episode is quite relative to Ginko's existence. The overall feeeling is one of mono no aware's finer aspects, and I can understand how it would translate romantically between subtly tragic individuals. Thanks for the music, that was nice. Since it's episodic, you can just randomly select an episode, right? Just go to episode 20, unless you want to take things slow, in your way. Oh yeah, 'Those who inhale the dew' is another fav along with 'the offline shore' – I might try to have 2-3 more editorials about Mushishi. We'll see. Very happy that you enjoyed the music *waves tail*. I tried to make a long read enjoyable enough so as not to have drop outs at some points >.< Plus, romance needs atmosphere and I thought 'why not try it'? Nice post. This is definitely one of my favorite episodes from the series. I do so love the characters in this show. Also, I can really appreciate how much attention you must have put to detail when you watched the episode – quite insightful.